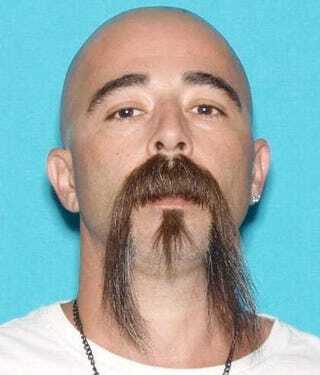 David Machado, who, according to authorities, is suspected of shooting and killing a Stanislaus County, Calif., sheriff’s deputy on Nov. 13, 2016, outside Hughson, Calif. The suspect in the killing of a Stanislaus County, Calif., sheriff's deputy has been arrested, the Associated Press reports. According to the report, Sheriff's Deputy Dennis Wallace, a 20-year-veteran, was shot twice in the head at point-blank range Sunday as he responded to a call about a suspicious car and person near a fishing-access spot just outside of Hughson, Calif.
Deputy Wallace ran the license plate of the vehicle, determined that it was stolen and requested backup, authorities say. Dispatch tried to contact Wallace but did not get a response. When more officers arrived on the scene, they found Wallace lying in the street next to his squad car with the gunshot wounds to the head. The suspect, identified as 37-year-old David Machado, was arrested later Sunday in Tulare County.